Skillet Chili Mac & Cheese is cheesy, spicy, and comforting! It’s the best of both worlds and it comes together in just one skillet! Greetings, peeps – hope you had a nice weekend! What with Ben and I being super cool and everything, I had no idea this was the weekend for Halloween parties until I opened Instagram on Sunday morning to see wizards, zombies, mermaids, and everything in between flooding my feed. FUN! The last time Ben and I went to a Halloween party was four years ago when I dressed up like Olympic gymnast Shawn Johnson, and Ben was forced to dress as went as her coach Bela Karolyi. It was HIGH-larious, I tell ya’. Did you dress up this weekend? 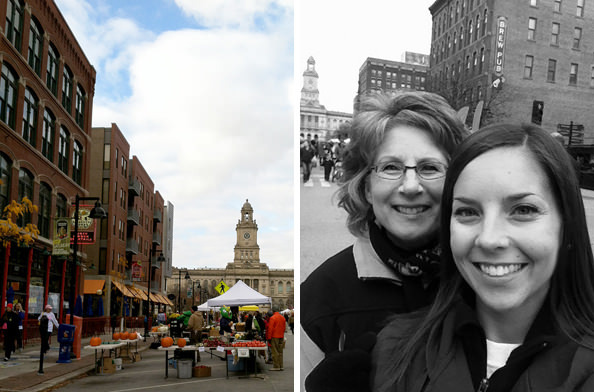 Anyway, in lieu of getting down to the Monster Mash, my Mom and I attended the last Farmers’ Market of the season Saturday morning. It wasn’t as cold as I thought it was going to be, but perhaps that’s because I was rocking 4 layers. Ok…it was still pretty cold! Although the crowds and booths were nothing compared to their former summer splendor, there was still a festive feeling in the air as everyone scrambled to make one final stop at their favorite spot before the market shut down for the all-too-long winter hiatus. The only thing sweeter than the mini pumpkin and gourd displays, were the puppies roaming the market. We saw at least a dozen of them (who knew fall was such a popular time to get a pooch?) 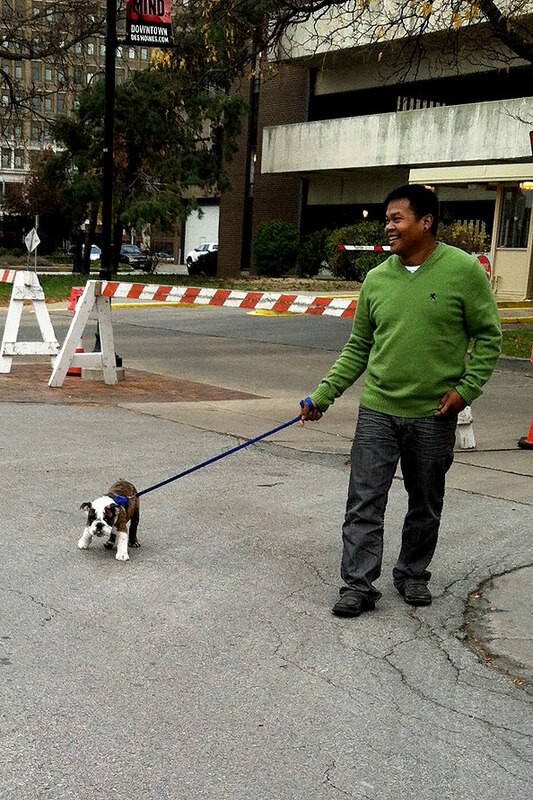 but the cutest was definitely this miniature bulldog, which Ben would have fainted over. He could barely control his limbs, it was SO ADORABLE! After all the hullabaloo died down, Ben and I retreated home to enjoy a warm & cozy skillet-supper for…supper. 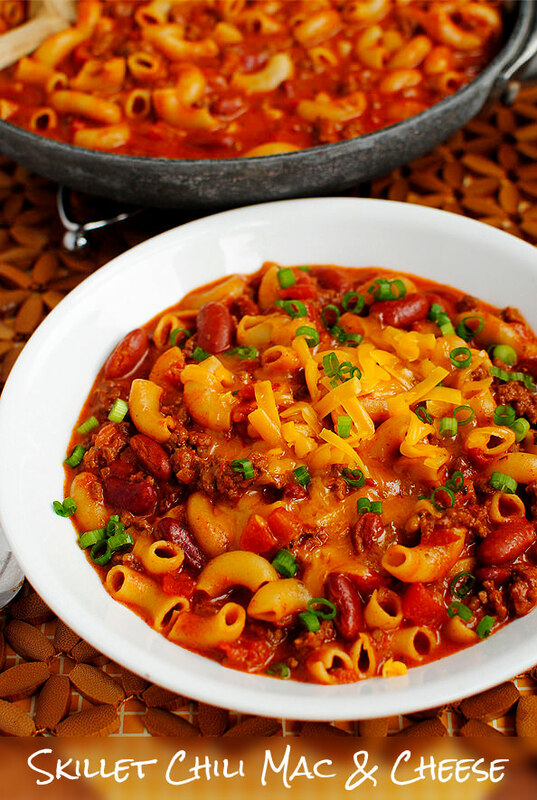 Skillet Chili Mac & Cheese. I featured this recipe on a Friday Favorites post almost exactly 1 year ago and have had the best intentions of making it nearly every week since. Does that ever happen to you? Well, with the 50s and lower set firmly in our sights for the next 5 months (or longer – SOB!) 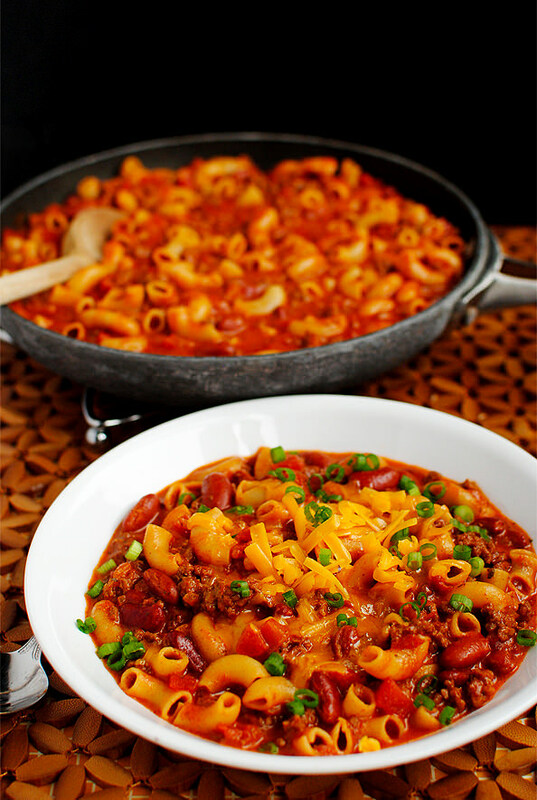 I thought now would be the perfect time to post the hearty supper recipe featuring ground beef, tomatoes, kidney beans, zesty spices, and elbow macaroni cooked together in one skillet. Quick, comforting, and, most important – easy to clean up! 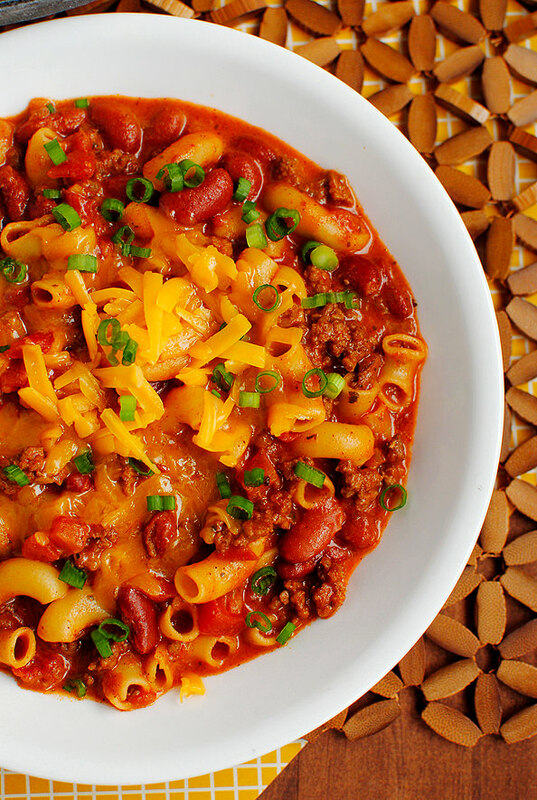 Somewhere between spaghetti, macaroni & cheese, and chili, this dish is a total crowd pleaser. Start the Skillet Chili Mac & Cheese by browning 1lb ground beef in a huge skillet – we’re talkin’ the biggest one you own – with 1/2 chopped onion, 2 minced garlic cloves, and a little salt & pepper. Cook until the beef is no longer pink, then drain and return everything to the skillet. Next add 1-15oz can petite diced tomatoes that’s been slightly drained of its juices, and 6oz tomato paste, followed by 4 cups beef broth and 1 can kidney beans that has been drained & rinsed. 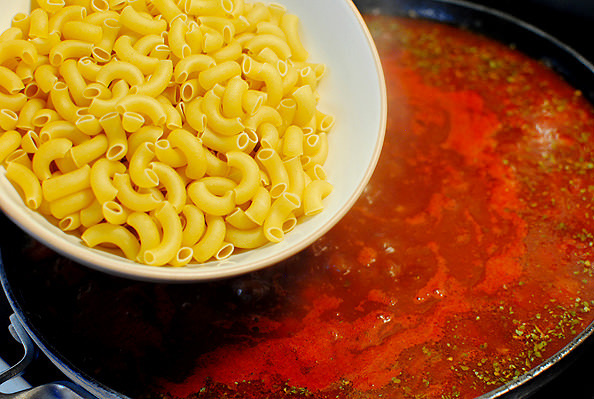 The tomato juices and broth will cook the pasta right in the skillet, instead of having to use a separate one to cook it in. Yet another reason why I absolutely adore these 1-skillet dishes! 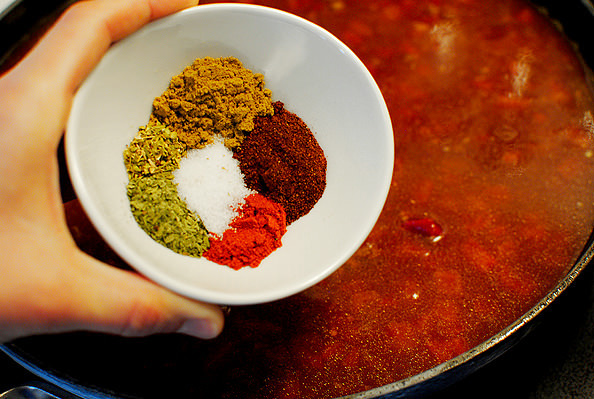 Finally, add zee spices: 1 Tablespoon chili powder, 2 teaspoons cumin, 1 teaspoon each paprika and dried cilantro, and 1/2 teaspoon each salt and dried oregano. Bring the liquid to a boil, then stir in 2 cups large elbow macaroni. Place a lid on top of the skillet then simmer for 5-7 minutes, or until the pasta is just barely al dente. It’s ok if it still has a little bite, as it will continue to cook a bit in the piping hot liquid. Finally, stir in 2 cups shredded 2% milk reduced-fat sharp cheddar cheese, which is about 7oz, until smooth. I was hesitant to try this low-fat cheese, but it melted like a dream. I would have never known it wasn’t full-fat! Let the skillet sit and thicken for 10 minutes, then scoop and serve with extra shredded cheese, if desired (I did,) crushed tortilla chips, or chopped green onions for a fresh bite. 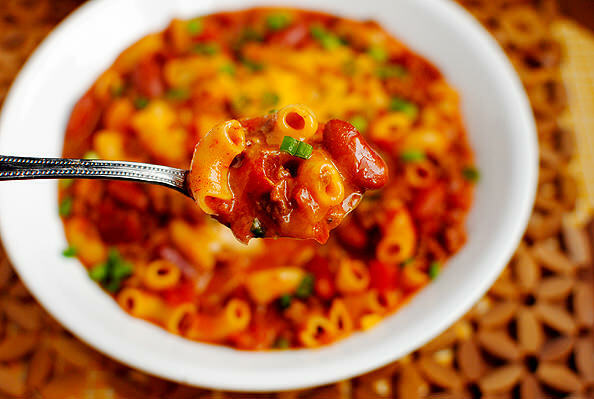 Skillet Chili Mac & Cheese is cheesy, spicy, and comforting! It's the best of both worlds and it comes together in just one skillet! 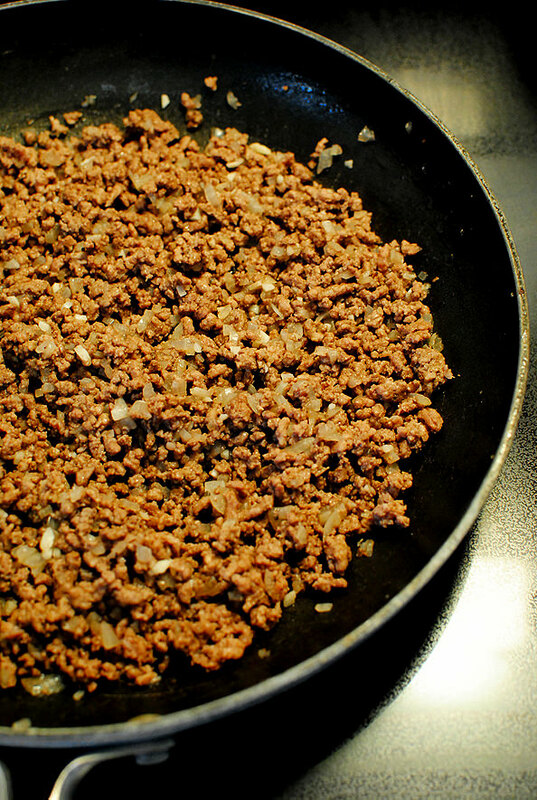 Add ground beef, onion, and garlic to a very large skillet over medium-high heat. Season with salt & pepper then cook beef until no longer pink. Drain then return to the skillet. Add petite diced tomatoes, tomato paste, kidney beans, beef broth, and spices to the skillet. Bring to a boil then add macaroni noodles and place a lid on top. Cook for 5-7 minutes or until noodles are just barely al dente (do not overcook,) stirring once. Add cheese then stir until smooth. Let dish sit off the heat and thicken for 10 minutes before serving. 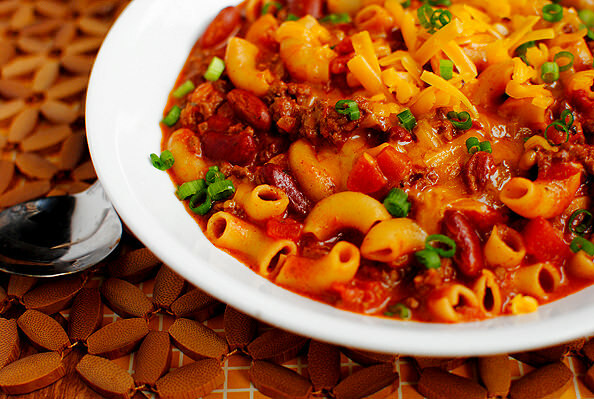 Skillet Chili Mac & Cheese is PURE comfort food! I loved topping my bowlful with extra shredded cheese and chopped green onions, but a few crushed tortilla chips would have been divine on here too. That mac and cheese looks so tasty and I love how it is a take on standard mac and cheese….that bulldog is cute as all heck! Reminds me of my pup when she was just a baby! Looks like another winner from IGE! This looks like pure comfort food. As it dips into the 40s in WI, I need it! Evie is too cute! Sounds like a great weekend and way to end it all on such a delicious note. This mac and cheese skillet looks stunning. So much better than any Hamburger Helper meal I’ve seen. Oh my goose bumps! Going on the meal list! This looks like it will be a family pleaser in our house. Will probably add some cornbread on the side! YUM! Yummy! Looks so much more rich & hearty compared to Hamburger helper! Can’t wait to try it! I want that bull dog!! 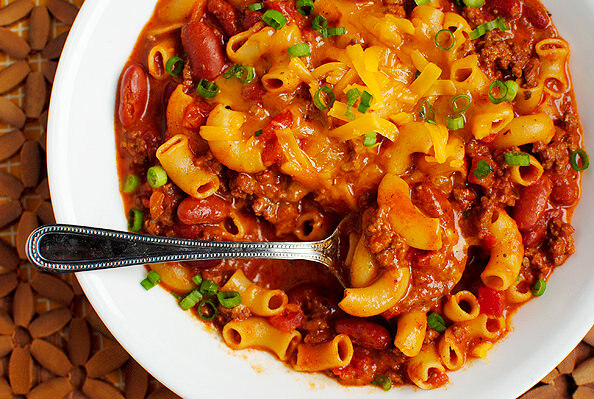 It’s like mac & cheese and chili had a baby…on steroids. Love it! 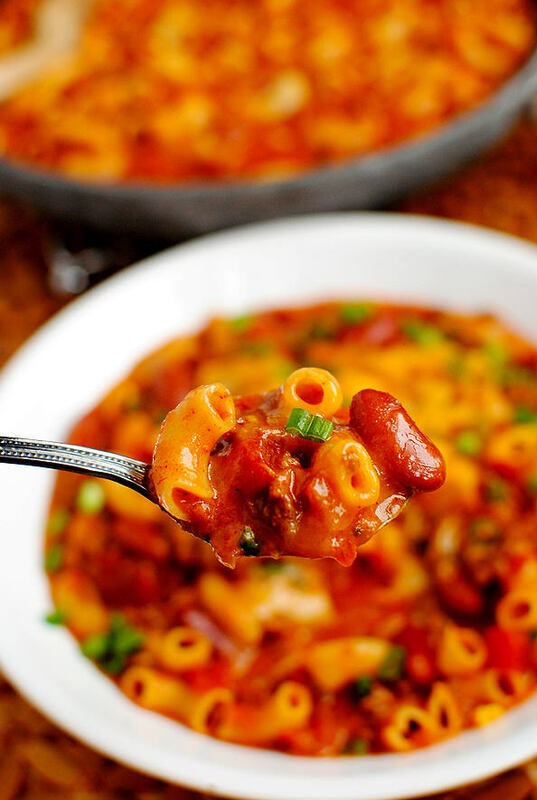 This skillet chili mac and cheese looks so easy and comforting! I dressed up as the Paperbag Princess on Saturday – and made my own costume out of brown paper and packing tape – SO fun and I got tons of compliments on it too. I did post the requisite Instagram photo (if I’ve made you curious, you can find me @onceuponarecipe). ;) Halloween is so fun! This is perfect timing! As I read this entry today we are hunkering down here in Maryland battling Hurricane Sandy. 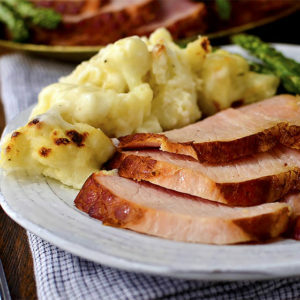 Comfort food is needed and I am cooking this as we speak before we lose power!! I had to improvise with a few of the ingredients but hopefully it turns out ok – Thanks!!! Stay safe out there – we’re all thinking about everyone on the east coast! Comfort food at its greatest! I’d love to have a piping hot bowl of that right now during this hurricane! Ummmm drooooool! That looks amazingly delicious. I’m so sad the farmers markets are closing up for the season! Is your brother two feet taller than you and Ben or is that picture at a weird angle? What the what? haha beautiful family, though! 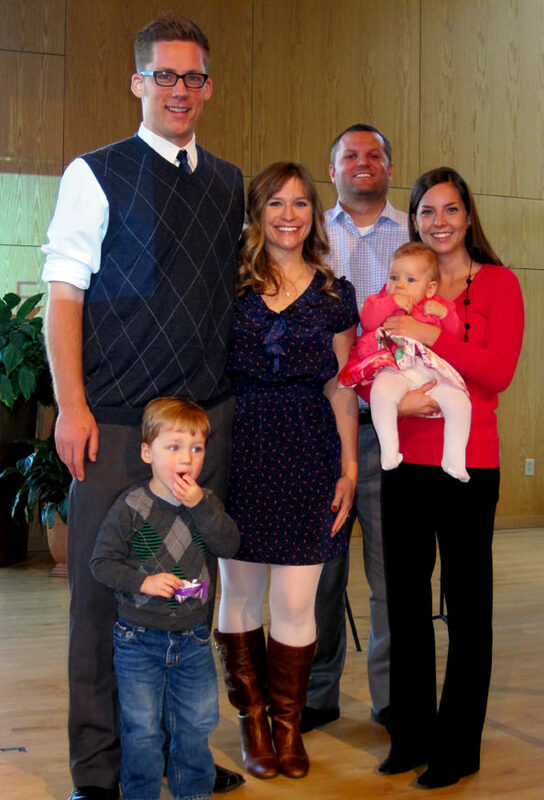 Haha, no he is ridiculously tall – 6’4, whereas Kerry (his wife) is around 5’3, I’m 5’2, and Ben’s about 5’10! 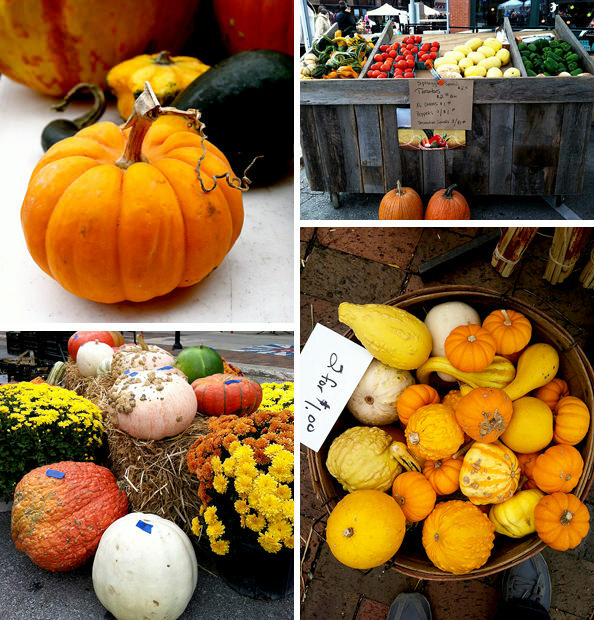 Yes, it was the last day of the Farmers Market this past weekend in KY as well. Hopefully you saved room for your papusa! Until next season..
That mac and cheese looks amazing, girl!! Yum! Oh and I didn’t party this weekend. I was over all the Halloween costumes pretty quick lol. I wanna make this but I don’t have all the ingredients and I’m stuck inside thanks to the hurricane – can’t wait to try it! Was Shawn Johnson ever coached by Bela Karolyi? I don’t think so… He commented at the 2008 Olympics but her coach was Chow. That looks amazing! I will be making that soon. Also, have you quit your job and you’re just blogging/freelancing full time now? Did I miss this post somehow? Tell me about it! ;) I write the blog full time, and freelance write and develop recipes for several other companies! I just have to ask if the Papusa lady was at the Farmer’s Market Saturday? Since they had cancelled a few weeks ago due to the cold, we wimped out and stayed home figuring they wouldn’t be there again and we wouldn’t be able to get our papusa fix for the last time of the season. My husband LOVES the spinach and cheese papusas! She was, but we weren’t hungry enough for one. So sad! ’til next year! Wow, this looks SO good and perfect for fall. I can’t wait to try this soon! I made this for dinner tonight. Mine didn’t look nearly as pretty as yours, but it was quite tasty. :) Thanks for the recipe! This sounds amazing, and I’m not a big mac and cheese person. 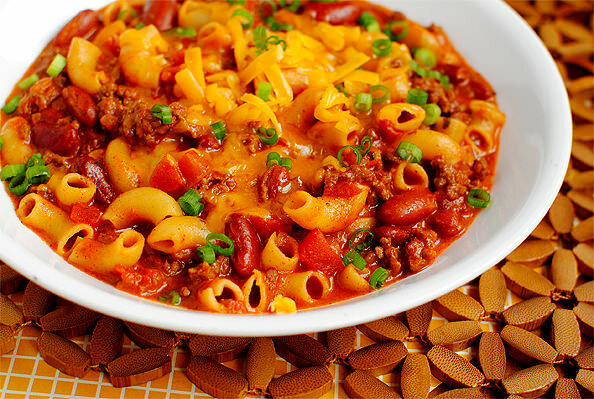 You sold me when you combined chili with it ;-) Definitely going to make this soon. 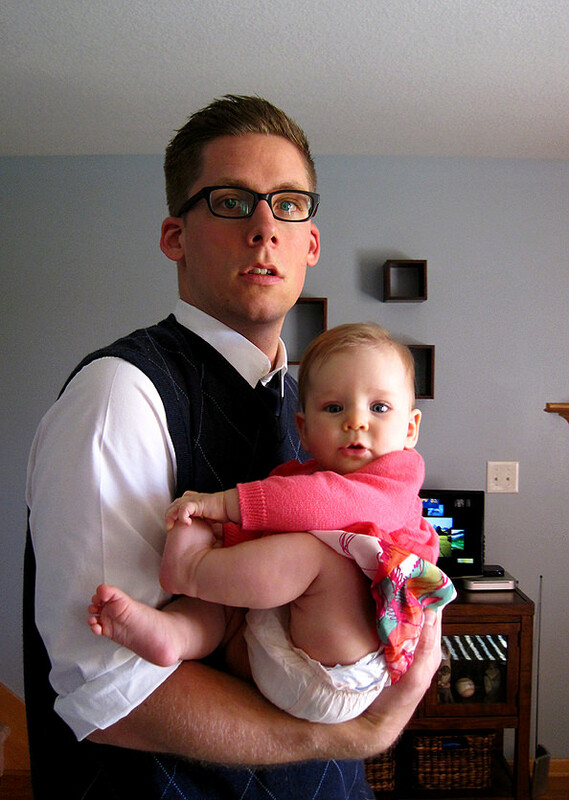 I have a niece named Evie as well (Evelyn, but Evie for short!). She’s a pretty feisty almost-five year old princess-loving kid! Made this tonight and it was SOOOOOO yummy! I used lean ground turkey, half the macaroni and half the broth (wanted it more meat & beans than pasta), the same amount of all other ingredients, and I was liberal with the spices. My husband loved it and wants it every night. I usually cook more “unmanly” food, so it was a big hit. 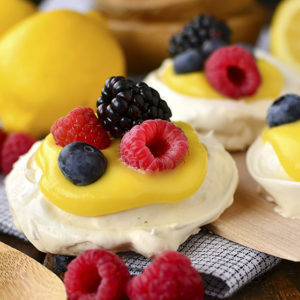 This looks delicious and I would love to make this for friends! Do you think it could be adapted to suit vegetarians by using quorn mince and veg stock?? What a great meal on a snowy day :) Thanks for the recipe! Loved how easy this was to put together! Made this tonight…husband loved it! Thanks so much! * I omitted the beef. We are eating less meat these days so I didn’t have any here. Thought about throwing in some chopped up leftover meatballs, though. hi, this looks crazy good, but i’m not big on spicy food, but i love mild chili. is this spicy? Nope, it’s not too spicy at all! P.S.- Also loved the cobb salad you recently posted after your trip to the wine country. I just discovered you! i’m an iowa girl by marriage. we just visited Ames for my husband’s hs reunion and to eat sweet corn. I loved this skillet food and will check out many more easy eats. i blog feast on fridays so will feature some of yours at: food for body and soul – welcomeheart.com after I’ve fed both. thanks! This is a great recipe, my whole family ate it. Made some cornbread to go with it great one pot dinner! I will make this many many times. Even with my big eaters 3 grown boys and my daughter and I we still had left overs. Another great meal for leftover. The taste was so good and it was the perfect consistency! I just want to lyk, my husband and I make this on a very regular basis for dinner! It’s his favorite meal and his whole face lights up when I tell him were having Skillet Chili Mac! Haha. Because we love it, I wondered if it would freeze well? Have you ever tried it? That is so awesome!! Unfortunately I think the macaroni might get soggy if you froze >> reheated the dish, BUT if you save a portion the next time you make the dish you could freeze it and have a little trial run before freezing an entire batch!